Write the name of each of the twelve months on a piece of paper. Now see how much you can remember that happened in each month of 2014. Include big things and small things, good things and bad things. For example, you might list things like getting a new pet, having a birthday, starting a new school year, starting a new job, going on vacation, catching the flu, welcoming a new baby brother or sister or son and daughter or even losing a loved one. Do you think you have a good memory? How much can you remember that happened in 2014? Have you noticed that people do a lot of remembering this time of year? Everywhere you look on TV, in magazines and on the internet, people are remembering the best and worst things that happened in 2014. They talk about the biggest news stories, the biggest movies and other special things that happened. More important than all that is remembering what God has done. New Year’s Eve can be a fun time to look back at the last year and remember the cool things God has been up to in our lives. The Bible talks about how important it is to remember what God has done. For years and years and years, God had been promising to give His special people, the Israelites, their very own country, a place called the promised land. They used to be slaves in Egypt, but God rescued them, and in this story He does a miracle by stopping the water of a river so the people could cross over to their new home. Wow, what a big day! The Israelites got a brand new home thanks to God’s amazing power, and they didn’t even have to get wet going there. God did not want His people to forget the awesome things He had done. He didn’t want them to forget how much He loved them, so here is what He told them to do. What did Joshua have the people do? How do you think they felt every time they saw that pile of stones? Look at all of these things that happened to you this year. Which months do you think God was with you? One month? Two? No, God was with you every single day. What are some things on your list that you can thank God for? Where did God show up this year? What are some hard things that He helped you through? Remembering the things God has done for you gives you the courage to face the future. The same God who was with you this past year, promises to be with you in the new year no matter what. Dear Lord, thank You for all that you did for us this past year. 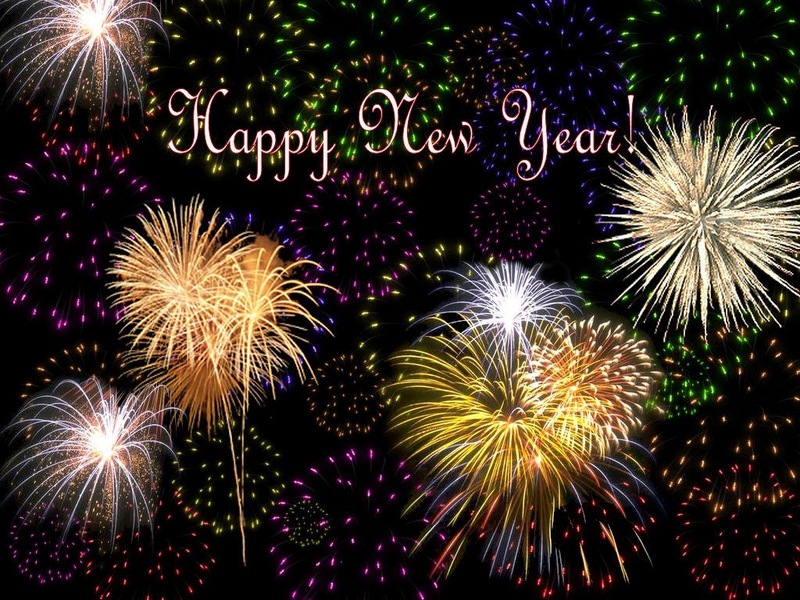 Thank You for being with us all year and thank You for promising to be with us in the New Year. In Jesus’ Name, Amen. While it's a good idea to take a look at your spiritual walk throughout the year, January 1st is often a time of renewal. A New Year, a New Start. So, instead of setting regular resolutions like losing weight, exercising etc., why not try to set goals to improve your relationship with God? Here are 10 ideas. Simple enough, right? Just get better at praying. It's not that easy. A lot of Christian make this resolution and soon fail, because they take too big a step at first. If you're not used to praying often, jumping into an active prayer life can be a daunting task. Maybe start off praying each morning when you get up, or even while you brush your teeth. Start off giving five minutes to God. Then maybe try adding another five minutes. Soon you'll find that you'll start going to God more often and for more things. Don't worry about what to talk to Him about, just talk. You'll be amazed by the results. Getting into the habit of reading the Word is also a common New Year's resolution for many Christian. There are plenty of Bible reading plans out there that guide you through reading your Bible in a year. It just takes discipline to open up the book every night. You may not even want to read the entire Bible, but rather use a year to focus on a specific topic or area of your life that you want God to help you improve. Find a reading plan that works for you. God calls on us throughout the Bible to do good works. Most churches have outreach activities or you can even find local volunteer opportunities in your comunity. There are so many people who just need a bit of assistance, and helping others is a great way to set a Christian example. Most churches have small groups or Bible studies geared toward every Christian. If not, why not be the one to get a group together? Start your own Bible study or put together an activity that some of the others at church can enjoy. A lot of groups meet one day a week, and those meetings are a great way to meet new people who believe and can help you grow in your walk. One of the most challenging issues for Christian is the idea of stewardship, which is the process of tithing. God calls on all Christians to be good stewards. In fact, money is mentioned far more often in the Bible than many other topics. Reading your Bible is an essential part of anyone's Christian walk, because it keeps your head in God's Word. Still, using a devotional helps you take the concepts in the Bible and apply them to your everyday life. There are numerous devotionals available, so you should be able to find one that fits your personality, interests, or your place in your spiritual growth. How many times have you shared your faith with friends or family. Make it your goal this year to talk to a certain number of people about your faith. While it would be great if someone converted or "got saved" through your discussions, don't get too caught up on that number. You'd be amazed how many people will end up believers from a discussion you have about what God has done in your life. It just may not happen while you know them. Also, use platforms like your Facebook, twitter and Instagram profiles to demonstrate your beliefs. Plant many seeds of faith and let them grow. One of the most difficult relationships can be between parents and teens. Teens are at a time in their life when they are entering adulthood and want to start making their own decisions. Teens need to remember they will always be their parents' child. Your different viewpoints make for some interesting conflict. Yet, God dictates that children should honor their parents and parents should not provoke their children to anger, but bring them up in the discipline and instruction of the Lord. So take some time to get to each other a little better. Do things with them. Share bits of your life with them. Even a small amount of quality time with your family will go a long way in helping your relationship. Not all mission trips are to exotic places, but almost all mission trips will change you forever. Between the spiritual preparations before you leave on your trip to the work you will do on the trip itself, God works through you and for you as you see people eager to hear about Christ and as you hear their appreciation for the things you are doing on your trip. A simple idea, but it takes a lot of courage to ask a friend to come to church. Faith is something most Christian have difficulty discussing with non-Christian friends, because it is often something very personal. Yet, many Christians would never have come to Christ without that one friend who asked them to come to church or talk about their beliefs. For every person who might shoot you down, there are two or three other people who will be curious about why your faith is so important to you. Taking them to church or church activities can help show them why. Dear Lord, we thank You for the New Year you are giving to us. We pray that we will take the advantage of the New Year to become more like the people You would have us to be. In Jesus’ Name, Amen. 1 This is the word that came to Jeremiah from the Lord: 2 “Go down to the potter’s house, and there I will give you my message.” 3 So I went down to the potter’s house, and I saw him working at the wheel. 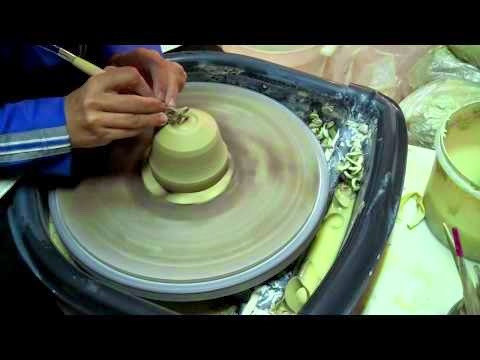 4 But the pot he was shaping from the clay was marred in his hands; so the potter formed it into another pot, shaping it as seemed best to him. 5 Then the word of the Lord came to me. 6 He said, “Can I not do with you, Israel, as this potter does?” declares the Lord. “Like clay in the hand of the potter, so are you in my hand, Israel. One day in this beautiful shop they saw a beautiful cup. They said, "May we see that? We've never seen one quite so beautiful." "Then I knew there wasn't any hope. I would never make it. I was ready to give up. But the door opened and he took me out and placed me on the shelf. "'I want you to remember, then,' he said, 'I know it hurts to be rolled and patted, but if I had left you alone, you'd have dried up. I know it made you dizzy to spin around on the wheel, but if I had stopped, you would have crumbled. I knew it hurt and was hot and disagreeable in the oven, but if I hadn't put you there, you would have cracked. I know the fumes were bad when I brushed and painted you all over, but if I hadn't done that, you never would have hardened; you would not have had any color in your life. And if I hadn't put you back in that second oven, you wouldn't survive for very long because the hardness would not have held. Now you are a finished product. You are what I had in mind when I first began with you.'" Has 2014 been a tough year? Have you felt like the teacup as you went through things that were uncomfortable? Remember God knows what He's doing. He is the Potter, and we are His clay. He will mold us and make us, so that we may be made into a flawless piece of work just like He has planned for us. Will you willingly yield to the Potter's hand? Dear Lord, thank You for the trials we have come through this year. Help us look at them as the tools that You used to make us into what You wanted us to be. In Jesus’ Name, Amen. 1999 December 28, 1999 my went to sleep and woke in heaven for his eternal retirement. Pain surrounded me during those dark days. I ached inside and missed him terribly. There was a great sense of loss, thinking my sons would never see Bumper again. Maybe you can relate and have experienced grief too? If so, you may be encouraged by this truth: for those who love and know the Lord, parting is only temporary. It’s not really goodbye, but see-you-later. The apostle Paul assured the Thessalonians of this truth. “The dead in Christ will rise first. After that, we who are still alive and are left will be caught up together with them in the clouds to meet the Lord in the air. And so we will be with the Lord forever” 1 Thessalonians 4:16b-17. That assurance is for us too. There are three words in Paul’s statement that provide hope, comfort, and assurance for the brokenhearted: we, together, and them. We (people on earth) who are still alive will be caught up together (two parties meeting) with them (those who are in heaven). These words of reunion indicate that God’s children never have to experience permanent separation. That’s good news! One day you and I will be reunited with our loved ones who believed in Jesus while on Earth. What a glorious day that will be. We don’t have to let grief burden our hearts. We have hope in God’s promise that one day we will be reunited with our loved ones. Holding on to that hope takes death’s sting away and fills our heart with anticipation. Even in grief there is hope. For those who accept the Lord as their Savior, death is not goodbye. It’s simply see-you-later. Dear Lord, thank You that death is not the end. Thank You for that glorious reunion one day when we will see our loved ones that went before us. And for the day we will see You face to face. In Jesus’ Name, Amen. He soared to the top of recording charts, but one incident changed his life's course. Tony Fontane was a popular American recording artist during the 1940's and 1950's. Born in Michigan, he was the son of a railroad worker who had converted to Christianity and moved the family to North Dakota where he operated a mission and lived in poverty. 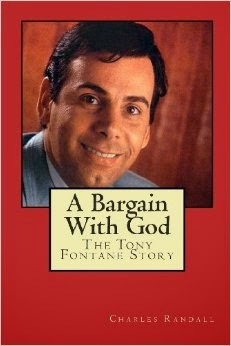 As a result, Tony hated religion. Singing was his passion, and he eventually flourished. He even celebrated notoriety on several television shows. But life changed on September 3, 1957. Having just finished a television rehearsal, Fontane was driving to his California home when another driver ran a red light and plowed into his sports car. Rescue workers labored for several hours before successfully extricating him. He was rushed to the hospital where he remained in a coma for 30 days. Fontane later wrote that it was while in a coma that God appeared to him in a vision and gave him one more chance. And he took it. He switched from atheism to Christianity and began a career in gospel music where he refused to sing anything else. As a result of a lawsuit with the William Morris Agency for breach of contract, he lost everything. But he actually gained it all when he made the big switch. My old things passed away at nine years of age-not totally in practice but completely in God's sight. 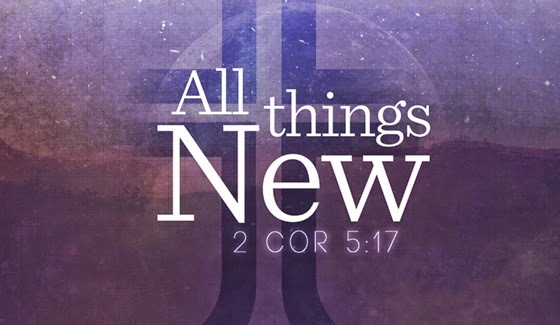 He took away the old sinful nature and gave me a new one with fresh wants, desires, and ambitions. No longer am I after what I or the world offers; I simply hunger to be obedient to him. Even if it costs me everything. What better way to begin the New Year than in a relationship with Christ. Have you made the big switch? Dear Lord, we pray for courage to share your love with all those we come into contact with so they can have the same hope we have. In Jesus’ Name, Amen. "Do you think we can save him?" The young boy asked. "I don't know. He's in bad shape. I don't believe we can," another boy added. "You've got to believe. We need him. He's important you know," the youngest child said. "He's the Christmas Snowman." "It'll take some work, but we can do it," the first child replied. Just a few days before they had worked for hours creating the perfect Christmas snowman. It was a town tradition to have one there in the park for the big day. Warmer temperatures, a little rain and wind had sadly carved away some of the finer points of this work of art. His hat was missing, only one eye remained and his carrot nose apparently made for a tasty lunch for some hungry rabbits. "But there isn't much snow to work with," another child added. Much of the snow nearby had melted. "Look over there, Old man Jeffries yard has plenty of snow. The sun doesn't shine over there," the first child. "I'm not going there. He's mean." "Then we'll never get it done!" The three boys sat quietly on a nearby bench just a few feet away from the snowman. Suddenly the youngest boy spoke up. "I'll go ask him. I'll go see Old man Jeffries. He can't be that mean!" The older boys were amazed at his bravery. "Are you sure you want to do this?" "Maybe he'll lock you up and you'll miss Christmas," one boy said. "Oh, go on. It's just snow. What's he going to do with it, anyway?" The youngest replied. The two boys stayed on the bench and watched as the youngest cut through the trees that separated the park from the man's yard. The child walked up on the porch and knocked on the door. In what seemed like an eternity, the old man finally came to the door. The brave boy's friends jumped to their feet in anticipation. Not so much ready to run to his aid, but ready to run away screaming in fear. There was really nothing to fear at all. The stories of the old man were local tales made up in the minds of children with more imagination than sense. The door closed and the young boy ran toward his friends. "Is he coming after us?" One child yelled. "No, he's coming to help us," the child replied. "He went to get his coat and a wheel barrel. He has two shovels and will meet us outside in a minute." The youngest boy ran back to the house while the other two walked slowly, cautiously toward him. "Come on, you slow pokes," the old man yelled. "We've got some snow man building to do." One by one they loaded the wheel barrel with as much snow as they could handle. Mr. Jeffries gathered a few pieces of coal for the eyes, a new carrot and an old hat he had in the closet. "I never thought...well...it's just that I thought you were mean," the oldest boy said. Mr. Jeffries just laughed at him. "Why did you want to help us?" The other one asked. "I have lived in that small house for many years and I have enjoyed watching the neighborhood children build a snowman in this exact spot each year just before Christmas. It's a tradition, you know. I was worried about him this year, too. I watched him crumbling and melting away the last few days. I knew he had to make it for Christmas. 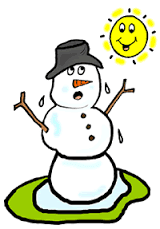 I would sneak out late at night each year and keep the other snowmen in shape. No one ever knew it. I'm not supposed to be doing things like this. They tell me I'm too old, but if you didn't fix the snowman I would have tried by myself," he said. "Well, we did it together," the youngest said. The four of them stood proudly in front the newest and biggest snowman that town had ever seen. "Excellent!" The boys all said in agreement. "Well, I better get home," one boy said. "It is Christmas Eve. You better get ready for Santa," Mr. Jeffries added. Then waving goodbye they all went their separate ways. In the early afternoon on Christmas Day, the youngest boy headed for the park to meet his friends. He had a brand new sled and a brand new friend he wanted to share it with. Old man Jeffries. As he approached the park he could hear sirens. His friends were standing on Mr. Jeffries front porch. "What's wrong?" The youngest yelled. "It's old man Jeffries...he needs help!" "Look out. Clear the way!" The medic screamed. The three boys stood just outside the door. "Is he okay?" The young boy asked. "Is he okay?" There was an odd silence in the room. Mr. Jeffries, barely responding, turned his head toward the boy and smiled. "I made it till Christmas...just like the snowman," he whispered. "Do you think we can save him?" One man asked. "I don't know. He's in bad shape. I don't believe we can." "You've got to believe. We need him. He's important you know," the young boy said crying. "He saved the Christmas snowman," he added. They rushed him away in the ambulance. It wasn't until later that day that they got the word. Mr. Jeffries had died. But, there is a magic in Christmas unlike any other day. It has been twenty five years since that day and until this very Christmas it is an annual event, a competition of sorts, to build the best Christmas Snowman in what has officially become "Old Jeffries Park." You see, that young boy grew up to be the Mayor. Ask him how and he'll reply, "You've got to believe!" As we wind down to the end of the year what is it that you believe in? Dear Lord. Help us believe in You. Help us share that believe with those that You bring into our path. In Jesus’ Name, Amen. 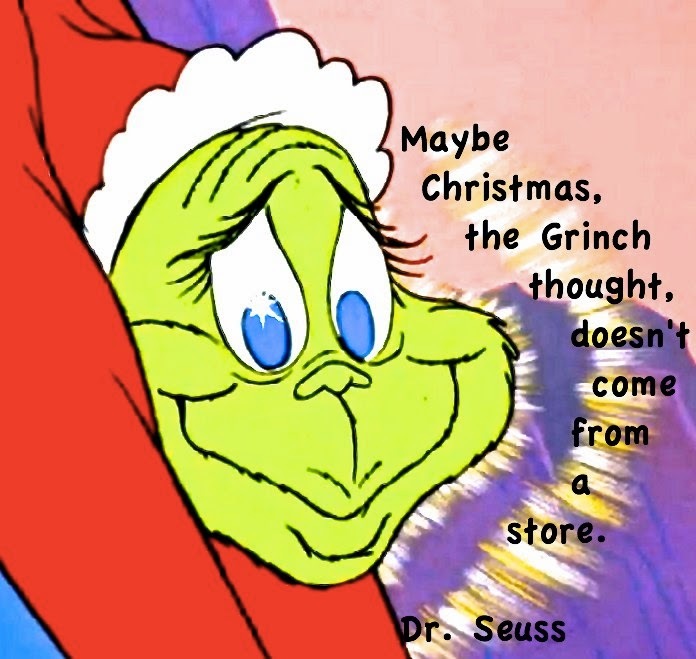 Christmas Doesn't Come From Stores. Q: What’s the best way to keep Christ in Christmas? A: Go to church on Sundays. It always amazes me that so many people complain that Christmas just isn't the same and yet they never seem to connect their spiritual emptiness with their lack of attendance at Church worship. If they are bombarded with commercial pressure for well over 2 months, then they are bound to be overwhelmed, especially if they don’t take time out to be with the Lord and His people during the season of Advent. Over the years, I've witnessed young parents crucify themselves emotionally and financially in order to make Christmas perfect for their children. I've seen families get frantic and fight over details about who is hosting Christmas dinner this year. And I've looked at beleaguered workers and sales people practically killing themselves in order to boost their figures in the last month of the year. In the midst of so much pressure, it’s so much easier to let go of God and miss the point of the whole celebration. The Church prepares us for Christmas in meaningful, traditional, and time-honored ways. Instead of wondering what Christmas is all about and turning it into a nightmare, we honestly and simply need to get with God’s program throughout the year and refocus our lives on Christ. The Gospel Truth is always this simple. We don’t need to put Christ back into Christmas; He is already there. We need to put ourselves back into Christ – Church gives us that wonderful opportunity every Sunday. Dear Lord, as we celebrate Christmas give us a heart to be in worship on Sundays and open our souls to Your Holy Presence. In Jesus’ Name, Amen. For he himself is our peace, who has made the two groups one and has destroyed the barrier, the dividing wall of hostility. On Christmas Eve 1914, during the First World War, the guns fell silent along a 30-mile stretch of the Western Front. Soldiers peered cautiously over the tops of trenches while a few emerged to repair their positions and bury the dead. As darkness fell, some German troops set out lanterns and sang Christmas carols. Men on the British side applauded and shouted greetings. 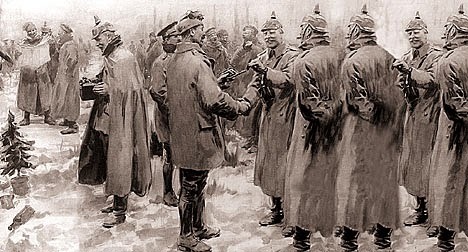 The next day, German, French, and British troops met in no man’s land to shake hands, share food, and exchange gifts. It was a brief respite from war that soon ended when the artillery and machine guns roared to life again. But no one who experienced “The Christmas Truce,” as it became known, would ever forget how it felt and how it fueled their longing for lasting peace. In Isaiah’s prophecy of the coming Messiah we read, “His name will be called Wonderful, Counselor, Mighty God, Everlasting Father, Prince of Peace” (Isa. 9:6). By His death on the cross, Jesus removed the “no man’s land” between us and God. “For He Himself is our peace” (Eph. 2:14). In Jesus we can find lasting peace. Let that message shine forth this Christmas. Dear Lord, we thank You for the special gift You gave for us. A gift that can bring peace to the world. In Jesus’ Name, Amen. This Christmas, remind yourself and your family that hope is only found in how much you've been loved by Jesus. It will be tempting to look for hope in the gifts that you receive or in the gifts that you give or in the people that you celebrate Christmas with, but those gifts will get old, your generosity will wrestle with your selfishness, and the people who say they love you will find a way to disappoint you once again. 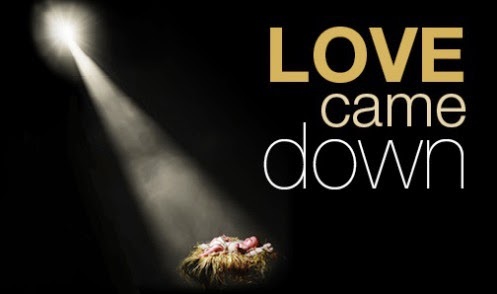 The only hope that you have this Christmas is in the love that God has for you. Husbands, you won't love your wife like you're supposed to. Wives, you won't love your husbands like you're supposed to. Brothers and sisters, you won't love your siblings like you're supposed to. Parents, you won't love your kids like you're supposed to. Kids, you won't love your parents like you're supposed to. But God will always love you perfectly. Christmas Day is a celebration of how much God loves us. Don't miss out on an opportunity to share that Good News. Remind yourself and your family to fix your eyes on Jesus and celebrate that there's eternal, life-changing hope for you! Dear Lord, Thank You for showing us love on that first Christmas. Help us keep our eyes fixed upon You. In Jesus’ Name, Amen. What Do You Know About Christmas? 3. Who insisted that Joseph and Mary go to Bethlehem? 4. How did Mary and Joseph travel to Bethlehem? 8. What did the innkeeper tell Mary and Joseph? 11. According to the Bible, which animals were present at Jesus’ birth? 12. Who saw the star in the east? 13. What “sign” did the angels tell the shepherds to look for? 14. What is a “heavenly host”? 15. What did the heavenly host of angels say? 16. Did the baby Jesus cry? 17. We Three Kings of Orient Are…Who were they? 18. How many Magi came to see Jesus? 19. Where did the Magi find Jesus? 20. Which Gospels give details about Christ’s Birth so we can answer these questions and get the TRUE facts? 1. False. For the church’s first three centuries, Christmas wasn’t in December—or on the calendar at all. If observed at all, the celebration of Christ’s birth was usually lumped in with Epiphany (January 6), one of the church’s earliest established feasts. Some church leaders even opposed the idea of a birth celebration. Origen (c.185-c.254) preached that it would be wrong to honor Christ in the same way Pharaoh and Herod were honored. Birthdays were for pagan gods. Not all of Origen’s contemporaries agreed that Christ’s birthday shouldn’t be celebrated, and some began to speculate on the date (actual records were apparently long lost). Clement of Alexandria (c.150-c.215) favored May 20 but noted that others had argued for April 18, April 19, and May 28. Hippolytus (c.170-c.236) championed January 2. November 17, November 20, and March 25 all had backers as well. A Latin treatise written around 243 pegged March 21, because that was believed to be the date on which God created the sun. Polycarp (c.69-c.155) had followed the same line of reasoning to conclude that Christ’s birth and baptism most likely occurred on Wednesday, because the sun was created on the fourth day. The eventual choice of December 25, made perhaps as early as 273, reflects a convergence of Origen’s concern about pagan gods and the church’s identification of God’s son with the celestial sun. December 25 already hosted two other related festivals: natalis solis invicti (the Roman “birth of the unconquered sun”), and the birthday of Mithras, the Iranian “Sun of Righteousness” whose worship was popular with Roman soldiers. The winter solstice, another celebration of the sun, fell just a few days earlier. Seeing that pagans were already exalting deities with some parallels to the true deity, church leaders decided to commandeer the date and introduce a new festival. Western Christians first celebrated Christmas on December 25 in 336, after Emperor Constantine had declared Christianity the empire’s favored religion. Eastern churches, however, held on to January 6 as the date for Christ’s birth and his baptism. 4. Who knows? The Bible does not say anything about a donkey. Luke 2:4 simply tells us that Joseph and Mary went from Nazareth to Galilee. Many biblical scholars think that because of their economic status they probably both walked but that is just speculation. 5. False, Joseph and Mary were not married when she became pregnant. (Luke 2:5, Matthew 1:18-25). 8. None of the above. The Bible does not say any words spoken by the inn keeper. In fact, Luke does not even mention an inn keeper, merely an inn and the fact that there was no room. (Luke 2:7). To get really specific, there is also no mention of a stable. 9. Unknown. Just like no words being recorded by the innkeeper, there is no mention where Mary delivered Jesus. Matthew says Jesus was born in Bethlehem and Luke 2:7 says Mary gave birth to Him and laid him in a manger. 10. A feeding trough for animals. Perhaps it was this fact alone that has brought about the popular assumption that Jesus was born in a stable or barn because of a manger being close at hand to put the Baby in. Using deductive reasoning, culture has also determined that if there is a feeding trough, there must also be animals nearby. Countless Nativity or crèche scenes depict that as fact. It is merely speculation and assumption. Scripture doesn’t back up those theories in any way. 11. We don’t know. There is no mention of animals of any kind around Jesus after His birth. Refer to my explanation #10. 14. A Heavenly Host (Hebrew Sabaoth “armies”) refers to a large angel army (Luk.2:13; Rev.19:19). 18. We don’t know for sure. The Bible does not tell us how many Magi visited Jesus. The tradition of “3″ probably developed because they presented 3 kinds of gifts. According to scholars the Magi’s journey probably lasted up to two years with an entourage of dozens or more people. 20. The Gospels of Matthew and Luke give us all the details of Jesus’ Birth. Dear Lord, we thank You for this special time of the year that we pause to celebrate Your birth that set into motion our Salvation. In Jesus' Name, Amen. Christmas Through the Eyes of a Child. Are We Blind, or Do We Have the Eyes of a Child? Don't just Start, But Finish. He will Make Sure You Win. Pearl Harbor - Are You Firing Blanks? Giving it Your All no Matter What. Night is Coming, When No One Can Work. Is Giving Up Worth It?